It seems like it was just a few weeks ago that we watched the GSM-only Pre 3 waltz through the FCC like it owned the place, and now today we’re getting to see the results of it’s more worldly brother’s stop by the testing bench. 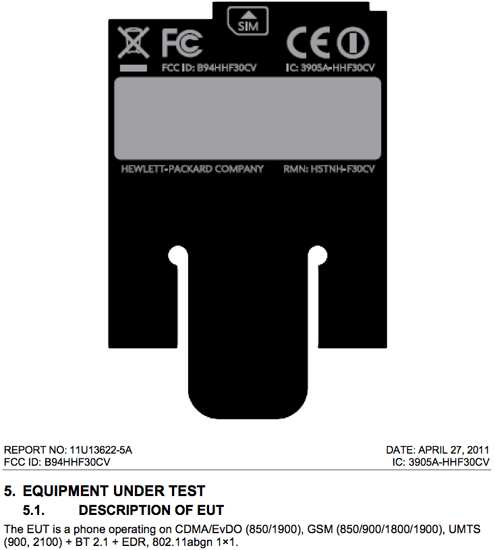 While the FCC never quite outs the name “HP Pre 3” in all the dozens of pages of the testing documents that certify this phone isn’t going to boil your brains, the Palm-style FCC label/battery pull tab gives it away as the Pre 3. It’s the “Description of Equipment Under Testing” that tells us what phone this is: it’s the CDMA+GSM world phone edition of the Pre 3 that’s destined for Verizon or Sprint (or both?). The phone packs the requisite CDMA/EvDO radio for getting on with Big Red and Pin Drop, plus a GSM and UMTS radio for working on not-CDMA not-USA networks. The UMTS frequencies are 900 MHz and 2100 MHz, which are the bands supported by pretty much every GSM network in the world, save AT&T. Not that you’d want to roam onto AT&T when you’ve got Sprint or Verizon at your back (though the 3G speeds would be nice). With the Pre 3 possibly due for a June arrival, this stop by the FCC is just one more required step along the path to availability. Source: FCC; Via: Wireless Goodness; Thanks to Teney for the tip!